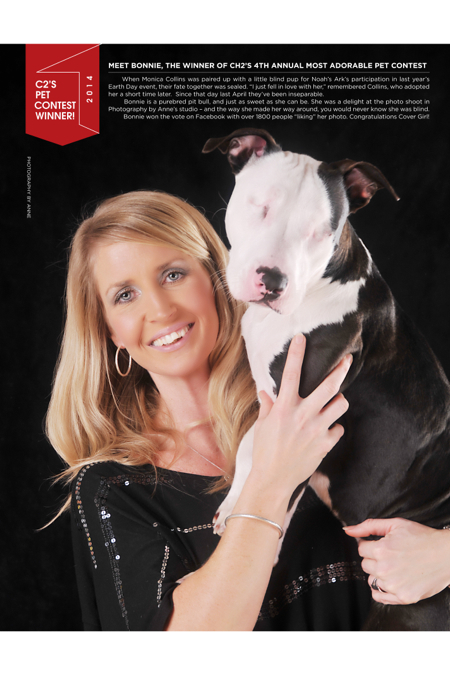 Hilton Head Magazines: CH2/CB2: C2's Pet Contest Winner! When Monica Collins was paired up with a little blind pup for Noah’s Ark’s participation in last year’s Earth Day event, their fate together was sealed. “I just fell in love with her,” remembered Collins, who adopted her a short time later. Since that day last April they’ve been inseparable. Bonnie is a purebred pit bull, and just as sweet as she can be. She was a delight at the photo shoot in Photography by Anne’s studio – and the way she made her way around, you would never know she was blind.